Imagine Sisyphus Happy by Keelay Gipson, with direction by Kevin Hourigan and original songs by Paul, is receiving a workshop-production at Pace University. Paul was incredibly fortunate to be a part of the 2018 Composer-Librettist Studio at New Dramatists alongside incredible fellow composers Marc Chan, J. Oconer Navarro, Milica Paranosic, and Zonia Tsang; playwrights Mia Chung, Keelay Gipson, Barbara Hammond, Sibyl Kempson, and Cheri Magid; and performers Christin Byrdsong, Kelvin Chan, Kimberly Chatterjee, Camille Harris, and Jessica Medoff. The studio is run by Nautilus Music-Theater director Ben Krywosz and music director Roger Ames. Wild Goose Dreams by Hansol Jung, with direction by Leigh Silverman, original live music by Paul, and music supervision by Charity Wicks, will receive its world premiere at La Jolla Playhouse on September 5 through October 1. Starring Yunjim Kim, Francis Jue, James Kyson, Carolyn Agan, Julian Cihi, Samantha Wang, Kimberly Monks, Deleon Dallas, Rona Figueroa, and Kyle Hester. Entangled by Leah Miles, with direction by Nate Bertone and incidental music by Paul, will have its premiere at Salem Theater on September 21 through October 1. Head of the Table was featured in a semi-immersive presentation at Kew Gardens on July 7 starring Issy Van Randwyck, Matthew Bunn, William Troughton, Kate Marlais, Will Barratt, and Michael Matus. Direction by Nicola Samer. Music supervision by Chad Kelly. Music direction by Tom Attwood. Featuring Carina Drury (cello), Sam Brown (lute), and Leo Duarte (percussion and flute). 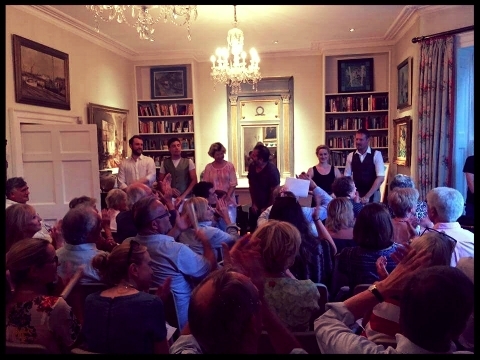 Huge thanks to Linda and Jan Pethick for letting us invade their home, Jill Saxton and Linda Pethick for canapés, wine and general encouragement, Father Nigel, St Anne’s Church, Helen Castor, and Zoe Simpson for dramaturgical support.